We’re starting our week out with one of our favorite crooners, Joni Mitchell. Inspired by Joni’s unorthodox guitar-playing style, Jeff chose “Night Ride Home” as this week’s Music Monday selection. You’ll hear the crickets and ambient night sounds in the background of this song, inspired by a moonlit night in Hawaii. Listen to the recorded album version below, or check out this live version! Hey guys, check out this article we found on Today’s website about a true Disney wedding. Alfred Angelo may have released a line of dresses inspired by the Disney princesses, but this bride really goes all out! In light of this article, we’ve thought of some other character-inspired themes that could make for an interesting day. Muppets – Give a nod to nostalgia with Fozzie Bear joke cards to keep guests amused during dinner, a jazz pianist to make even Rowlf proud, and plenty of Kermitinis. Mario Brothers – This one’s for all the gamers out there. Consider a non-traditional Princess Peach-inspired gown, square pixel brownies for dessert, and a photobooth with plenty of cap and mustache accessories! Check out this cute interpretation! Superhero – Is your groom a Clark Kent or a Bruce Wayne? Or perhaps Peter Parker? Channel your inner superhero to guide the color scheme and vibe of your celebration. Harry Potter – I mean, how awesome would this be? A wedding on Hogwarts castle grounds, hippogriff taxis for guests who’ve had a little too much butterbeer, oh yeah and using MAGIC to do all of your planning and decorating (instead why not try out an awesome wedding planner!). Am I getting carried away with my imagination? You know you are too. This morning at Stitely we jumped at the first chance to play Peter Bjorn and John’s “Second Chance” for this week’s Music Monday. Chicago was fortunate enough to have this Swedish trio visit Lincoln Hall in May of 2011, the same year in which this song was released on their album “Gimme Some.” You might also recognize their name from the popular single “” released back in 2007. Enjoy! 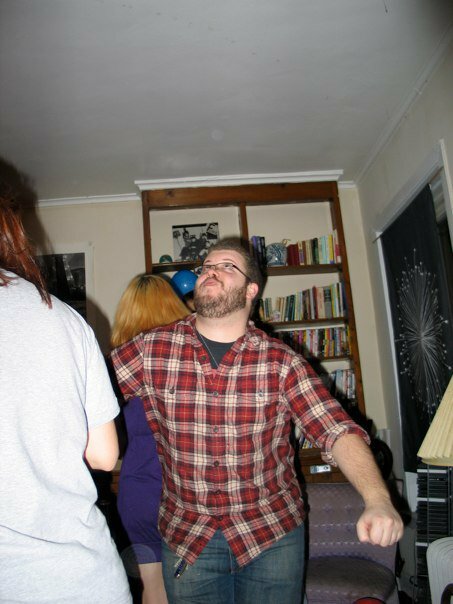 Yup, I flail around like a fish out of water… and I KNOW I’m not the only guy out there who is somewhat less than enthused about someday dancing in front of a room of family and friends only to been seen as a fool. Naturally of course I will do it for two reasons: 1) Because I will undoubtedly love my bride and nothing will stop us from having a good time (even if it is at my expense) and 2) Liquid courage. Gentle Reminders – Remind us every once and awhile how important it is to you that you look great dancing together. Don’t go the “you’ll look like an idiot if you don’t learn how to dance” route. It scares us off more. If it is important to you, it is important to us. Teach – Teach us a few steps we can use. We might groan and say we’d rather watch the game, but we’ll be thanking you after the reception. It could be fun! Laugh WITH me, not AT me – Again, I don’t like feeling like a fool, so if I mess up or am doing some ridiculous dance move don’t laugh at me – let me know that it’s goofy and laugh with me. Heck, join in so we look like fools together. Just don’t leave me hanging! Basically, it just takes a lot for guys like me to get the cojones to get up and dance the night away, even at my wedding. So please, be encouraging above all else – who knows, with a little help, your groom may even find out he likes dancing! Blech! With the gloomy sky and impending rain everyone at Stitely needs a pick-me-up. Luckily, today’s music pick, “Hallways” by Montreal band Islands, is an instant mood booster (according to HuffPo). This single is from latest album “A Sleep & A Forgetting” which debuted last Valentine’s Day. We just love this fun video! Looking to go green at your wedding? Check out our top six tips to throw a fun eco-friendly party while reducing your carbon footprint! Since everything else is moving online, why not invitations too? You can keep the classic touch of traditional invitations by working with a designer but sending them via e-mail saves paper and trees. Greenvelope helps save trees by working with clients to create the perfect wedding e-vite that emulates the opening of a traditional printed invitation so you don’t lose that special touch. If all weddings this year used paperless invitations, we could save about 50,000 trees! Even picking a venue that has a green initiative can give your wedding the eco-friendly touch. Find an event space that has met the U.S. Green Building Council’s LEED (Leadership in Energy and Environmental Design) Rating System, which sets the standard for sustainable spaces. Learn what your venue does to be sustainable! Venue Six10 is a great option because of its unique 6700-square-foot green roof that has special vegetation that keeps the building cool, helps with air pollution and much more. Certain wedding favors can contribute to waste so give something memorable yet eco-friendly to give your guests. Plant a tree in your guest’s name or even give out trees for them to plant in your honor. For a more creative route, include sachets of herb or vegetable seeds so your guests can start their own eco-friendly, edible garden. Have healthy alternatives during your wedding dinner such as free-range chicken or fresh, wild salmon. Work with your caterer and learn where your food is coming from and if it is eco-friendly. For dessert, include free trade coffee for your guests. Remember going organic doesn’t have to substitute for taste! In lieu of gifts, you can raise money for a charitable organization. Choose one that has a special meaning for you or find one online that shares your same values. Your guests will appreciate the gesture and will love knowing that their gift is going somewhere meaningful. Remember that going green doesn’t have to cost you more green! Take some time to see what options you have. If paperless invitations aren’t for you, you can always find some other way to be eco-friendly. The Chicago Green Wedding Alliance is a great resource for all of your green wedding needs including approved green vendors, caterers, florists and more. If you want a more literal green wedding, however, check out The Knot’s wedding ideas for using all shades of the color green! Or you can take an even more literal attempt from singer, Kelis by having an all-green wedding dress! Now, that girl knows how to go green! Are you looking for healthy and delicious recipes to help you keep those New Year’s resolutions? Never fear, Peggy, Stitely‘s chef in residence, has a quick and tasty recipe for kale and avocado salad. Mash the avocado pulp with the lemon juice, salt and pepper until well-combined and smooth. Alternatively, you can process together in a food processor. Combine the avocado lemon mixture with the vegetables. It is actually easiest to use your hands to ensure that the kale is well-coated with the avocado dressing. Taste and adjust seasonings. If you prefer a creamier texture, use more avocado.